Who won Gramophone's 'Artist of the Year' Award last year? And how about the year before? Re-live the past years of winners of the 'Oscars of the classical music world', and take a look at this year's winner! Gramophone's Editor-in-Chief, James Jolly, said of the performer: "This award, made by public vote, honours a musician in his prime who is in demand the world over and who has given us notable recordings of the Brahms Violin Concerto, Beethoven violin sonatas, and the three Brahms sonatas." Operatic soprano Dame Kiri Te Kanawa started her career as a pop star in New Zealand, but enrolled at the London Opera Centre in 1966. She was made a Dame Commander of the Order of the British Empire in 1982. Sir Simon Rattle will forever be remembered as the conductor in the London 2012 Opening Ceremony, but his career began decades before. In 1974 he was made assistant conductor of the Bournemouth Symphony Orchestra, and became Principal Conductor of the City of Birmingham Symphony Orchestra in 1980. John Eliot Gardiner founded the Monteverdi Choir, the English Baroque Soloists and the Orchestre Révolutionnaire et Romantique. He is famous for his interpretations of Baroque music, and has recorded many albums using period instruments. French composer and conductor Pierre Boulez was born in 1925, and continues to write music and perform. He's seen as one of the leading 20th century composers. Anne-Sofie von Otter performed with Swedish soprano Katarina Dalayman as Brünnhilde and Waltraute in the 2009 production of 'Götterdämmerung' (pictured). She made her debut as Alcina in Haydn's 'Orlando paladino' in 1983. Cellist extraordinare Yo-Yo Ma's recordings of Bach's Cello Suites are highly acclaimed. He recorded one in 1983, and another between 1994-1997. Conductor Riccardo Chailly started his career in opera, and gradually adopted symphonic repertoire. He's recorded complete cycles of Brahms, Mahler and Bruckner symphonies. Martha Argerich started playing the piano when she was just three years old, and gave her debut concert when she was eight. She won the International Chopin Piano Competition in 1965, aged 24. Sir Antonio Pappano was knighted in 2012 in the New Year Honours list for his services to music. He first conducted at the Den Norske Opera in 1987. Italian coloratura soprano Cecilia Bartoli made her debut at the Metropolitan Opera back in 1996 as as Despina in Mozart's 'Così fan tutte'. She returned the following year to sing the title role of Rossini's 'La Cenerentola'. Maxim Vengerov has been a professor at the Royal Academy of Music since 2005. 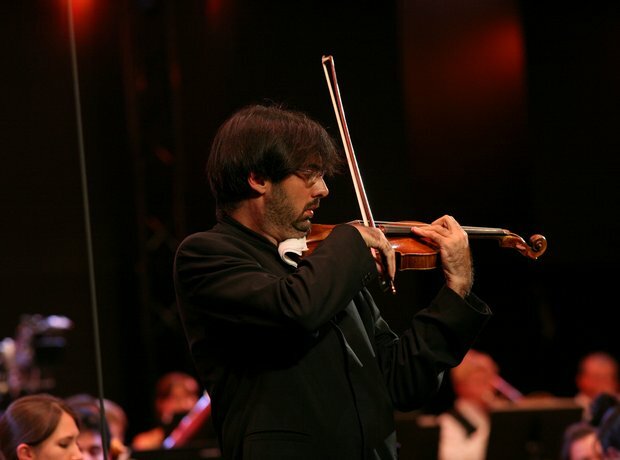 He plays the violin and viola, and is also a conductor. Marin Alsop won the Koussevitzky Prize as outstanding student conductor at the Tanglewood Music Center in 1989. In the same season as her Gramophone Award, she won the Royal Philharmonic Society's conductor's award. The Czech mezzo-soprano also won a Gramophone Award in 2001 in the Solo Vocal category. She was awarded the French honour of 'Chevalier de l'Ordre des Arts et des Lettres' in 2003, before picking up the Gramophone Artist of the Year the following year. American conductor, pianist and composer Michael Tilson Thomas is music director of the San Francisco Symphony Orchestra. His international career began when he was 24, when he made his debut with the Boston Symphony Orchestra. Canadian pianist Angela Hewitt completed her eleven-year project to record all of Bach's major keyboard works in 2005. She also launched her own festival, the Trasimeno Music Festival, held annually in Perugia. Another violinist this year - this time, German performer Julia Fischer. She also plays the piano, and made her public debut as a pianist in 2008. Violinist Hilary Hahn has enjoyed a successful classical music career since she signed a record contract, aged 16. She specialises in music by Bach, but has recently recorded albums of music by Schoenburg and Ives. The voices of Classic FM, The Sixteen, was founded in 1979. They have now launched a training programme, called 'Genesis Sixteen', designed to nurture the talents of younger singers before they become professional. American mezzo-soprano Joyce DiDonato has performed in opera houses all over the world. She was inducted into the Gramophone Hall of Fame in 2012. The Venezuelan conductor's Gramophone Award is just one on a list of prestigious awards. He's also won a Grammy for his recording of Brahms Symphony No. 4 in the Best Orchestral Performance category. In the same year he was named Malta’s first Cultural Ambassador, Calleja scooped this prestigious accolade in 2012 - unfortunately, he was unable to attend the star-studded ceremony at London's Dorchester Hotel. After an incredible year seeing her realise her own production at the Globe Theatre, Gabriel, Alison Balsom was crowned Artist of the Year 2013. "I just believe completely in the trumpet and what it can do, what it can say to people, and who it can reach," she said.